Three who are One and have no equal. The Seven Great Powers of Déa. And that I turned from Grace to seek Knowledge. And that She rose again by Her Mother’s Love. And return them to Our Mother. My name Sorella Roselyn and I’m a Filianist. Filianism is the religion of Our Mother God and Her Holy Daughter. The Creed above, very briefly, outlines the basis of what we believe. Our religion is a subset of Déanism; an umbrella term for those who worship God the Mother independent of a male consort, father or son god (however some Déanists do incorporate the divine masculine in their faith, albeit carefully to avoid His image overshadowing Her). Déanists may or may not believe in the Holy Daughter, or follow the Filianic scriptures, or observe the Wheel of the Year. All that one requires to be a Déanist is the belief in God as Mother; the Supreme Deity, immanent but also transcendent from Her Creation rather than being an earth or lunar goddess as observed in Pagan Goddess religions such as Dianic Wicca. For Filianists, God (who we call Déa) exists as a divine feminine Trinity. 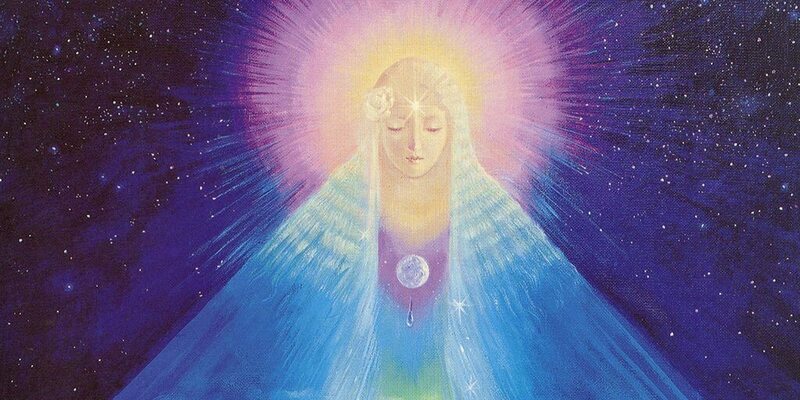 She is the Bright Mother, the Creatrix of the cosmos and God-above-Us. She is also the Holy Daughter, the dimmed reflection of Her Mother who commands the energies of creation and who is God-with-Us. And lastly She is the Dark Mother, also called the Mysteria, who is beyond all knowledge and form – God-the-Absolute. While it common to compare the Filianic Trinity to the Christian Trinity, a more apt comparison would be to the Hindu God Brahman who exists as Brahma (Creator), Vishnu (Preserver) and Shiva (Destroyer). Their feminine counterparts, found in the Shaktism, would be the closest parallel to the Filianic trinity; Saraswati, Lakshimi and Parvati. The concept of a Triple, or Tri-unity Goddess, is one that has been replicated across many cultures and religions, primarily those now considered Pagan, yet still have thriving traditions in modern times. Even in esoteric Christianity, particularly Gnostic and mystic circles, there is growing number of believes in a feminine Trinity to balance the masculine Father, Son and Holy Spirit. Others believe the Holy Spirit to be feminine Herself and correct Her name as ‘Mother Spirit’. The Divine Sophia, who is the form of which Déa came to myself as, exists in a three-fold form as Barbelo or Sige; the forethought of the All and cosmic mother, the creatrix Sophia or Pistis, and the Daughter Soul; Zoe. Sophia is the Greek word for Wisdom; Her trinity names thus translating as Silent Wisdom, Faithful Wisdom and Living Wisdom. While many Gnostic traditions regard Sophia as at fault for the flawed creation of the world, or personify Her as the lost soul desiring her male bridegroom and saviour (Christ), there are many who detach Sophia from her patriarchal demotion and worship Her as God in Her own right. For Filianists; the Holy Daughter does not represent the soul in need of a saviour. She IS the Saviour. As explained beautifully in our scriptures, we believe that the Bright Mother created all things perfectly in the beginning, to be one with Her. Maid, the soul of humanity, was created in Her likeness as Her First Daughter. However the Maid wished to experience that which was outside Déa and so turned from Her, unable to look upon Her brightness or live in perfection. To Orthodox Filianists, the reason for this was due to temptation by the ‘Snake’ which represented the illusion of separation from Déa. However in the Janite Tradition it is believed that the motivation for this was not of will but to seek knowledge. To experience both pleasure and pain which she could not when living with Déa. And this was done so according to Déa’s will as the soul of Maid came from Her and was a fragment of Her being. Whatever the intention, for Filianists that is the reason for why we live in a world of khear (separation) where suffering exists, where we are subject to the wherde (karma) of our actions and where our souls are reincarnated on the wheel of life. Déa did not exile us or punish us, rather we chose this state and each life we live is another step on our journey back to Her. We believe that the Holy Daughter is the reason we have any hope of purifying our souls from khear and reuniting fully with Our Mother. According to the mythos, the Mother birthed the Holy Daughter (different from the First Daughter) as an aspect of Herself to reach Her children beyond the illusion of khear. While the Bright Mother is symbolised by the sun, beautiful yet blinding, the Daughter is symbolised by the moon, reflecting the light of Her Mother for us to see in the darkest of places. While the Bright Mother is the Light of Déa, the Holy Daughter is Her Love given form. It is the mission of the Daughter to spread Her Mother’s light to every corner of the cosmos, even to the farthest reaches where all hope seems lost. The Mythos tells of how the Holy Daughter wilfully descended into Hell itself, suffering agonising torture and humiliation, before coming face to face with the Dark Queen; the antithesis of Déa who represents the soul of Maid at her most lost and cruel. The Holy Daughter allows the Dark Queen to ‘kill’ Her, only for the Bright Mother to shatter the gates of Hell after following Her Daughter’s descent. The Bright Mother’s tears of sorrow revived the Holy Daughter and restored Her to life; thus managing to conquer death itself. She is thus able to rise from Hell and carry the souls of all those lost with Her into Heaven. This is of course a fictional story, but its purpose is to explain the mission and passion of the Daughter in images for Maids to understand. There are obvious parallels to other dying-and-rising saviour gods and goddesses. While Christians recognise similarities to the passion of Christ, there are also illusions to the descent of Inanna, the return of Persephone and also the shattering of Sophia as the Holy Soul unto the world. We believe these myths and more are evidence of the truth being shared and interpreted differently throughout time of God giving a part of Herself to save us from being eternally lost from Her. Whether the mythos of the Scriptures is taken super literally or figuratively or a mixture of both is irrelevant for a Filianist. To be a Filianist is to follow Our Lady, the Holy Daughter, and Her teachings. Many of these are included in the Clear Recital along with the Mythos. These teachings as they are written were compiled by a group of women in Oxford during the 1970’s who referred to themselves as Madrians. While the themes and images of God the Mother and Daughter have existed for thousands of years, the structure of the Filianic faith arguably began with the Madrian movement (though the beliefs of those women at the time do not always represent those of Filianists today). Many accept the Teachings, though inspired by Déa, to still be subject to criticism as – like all religious texts – they are still the work of Maids, who are not perfect. However, when reading the teachings, their central message is clear; Love. Love of each other, Love of Self and Love of Déa. Therefore, the very nature of being a Filianist, is to Love. Our Lady is the form of Déa’s Love. To worship Her is not simply through prayer or studying scripture, important as those aspects are. It is in being compassionate, in being kind and loving, to ourself and others, we are worshipping Her. In sharing the light of Déa to all the earth and beyond, we are ensuring that Her suffering was never in vain. To worship Her is not to hate, or envy, or seek revenge or harm unto others. To worship Her is not to proselytise or judge but to be a friend to every living creature and seek to do Good in Her name. To be a Filianist is to try to live in the image of the Seven Janati and inhabit their virtues. While most Filianists have a patron Jana they connect to, the goal of a Filianist ideally is to balance these virtues within oneself and society so as one does not become unbalanced. For instance many believe we are in an age where the ‘Vikhelic’ (Madria Vicka) principle has overtaken the others, and thus we have more violence in the world than compassion or joy or restraint. But when channelled correctly, the virtue of Madria Vicka can be used to help Our Lady’s light shine brightly, so long as it remains in balance with the others. Our Lady Herself has been given many names throughout eternity, as has Our Mother. Most Filianists refer to the Mother as Mari or Marya; a holy name which has its place in multiple cultures for the Divine Mother, outside of the obvious Virgin Mary of Christianity. The most common name for the Holy Daughter in Filianism is Anna, as well as Inanna, Rhi’annë, Hannah, Jana (with a silent J). She has also been called Kore, as in ‘maiden’, as well as Zoe by those like myself whose form of Déa has been Sophia. Anna often means Grace, though ‘Jana’ also means Gateway, as well as being strikingly similar to the Islamic word for Paradise; Jannah. Whatever Her name or Her image, She is there for those who seek Her. The Dark Mother, Déa Mysteria, has no name or form – She Is Who She Is. In closing; this blog is simply one Maid’s attempt to log her own journey as a Filianist, to walk in the path of Our Lady and help guide others into the arms of Our Mother.